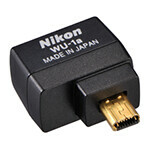 Nikon has announced they will be connecting the world of Digital SLR (DSLR) photography with Android devices (and iOS devices coming in fall 2012) via a dongle called the Wireless Mobile Adapter WU-1a. The $60 dongle will connect your Android devices, as long as they are running Android 2.3 (Gingerbread) or higher. The device, which pairs with an app that is soon-to-be available in the Google Play Store, allows you to transfer photographs from the camera to your smartphone or tablet wirelessly, as well as letting your mobile device act as a viewport and remote shutter release. While the ability to move your DSLR shots over to Facebook or Instagram may be of more interest to well-healed non-professional users, we expect the ability to frame and snap photos remotely from a tablet or phone could find its way into many studios. Images captured by the D3200, or already saved to a memory card inserted in the D3200, can be transferred to a smart device over a wireless connection. Transferred images can be viewed in the smart device display, or uploaded to a blog or social networking site to share beautiful photographs with a broader audience. The camera's live view display is shown in the smart device screen, enabling remote control over shooting. The live view display shown in the smart device screen always shows the current view through the lens mounted on the camera (live view display), allowing users to accurately frame and predict results with remote control over shooting. Basic information, including the camera's battery indicator, whether or not an AC adapter is connected, and number of exposures remaining, as well as shooting information such as shutter speed, aperture setting, and focus points is displayed in the smart device screen. For more product information check out the source link below. Were is the windows support b8tches. who cares about windows when more than 90% are on android or ios!! i care about windows so semperfi b-tch. Not only would I not call the D3200 a "prosumer" camera (it's another soccer-mom camera), but I doubt this camera would ever be in a studio. With such a gadget to communicate with a phone or tablet, this is more of a toy rather than anything useful. I guess there are quite a bit of people that want to take photos directly from their DSLR to Instagram, but with a camera like the D3200, I'd expect those pictures to be chics taking pics of themselves in the mirror and guys taking random shots of office supplies or grass in their back yard.